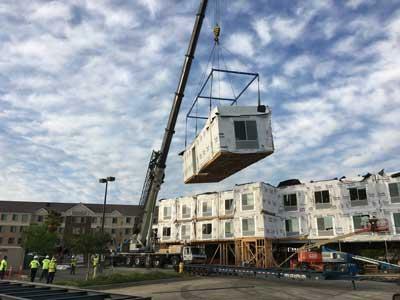 BETHESDA, MD—Marriott International has unveiled a comprehensive expansion of its initiative to drive adoption of modular construction of hotels in North America. In addition, the company said it expects to sign 50 hotel deals in 2017 that incorporate prefabricated guestrooms or bathrooms—more than 10% of the select brand signings expected for the region this year. With the modular process, hotel guestrooms and/or bathrooms are manufactured away from the hotel site in a climate-controlled factory. Once made, the prefabricated units get transported to the hotel site, where the hotel’s base podium has already been built. The units get stacked into place by crane, at which point workers complete the building on-site including electrical, plumbing and other finishing work. Unlike traditional methods, this process avoids time-consuming challenges that can delay construction such as skilled labor shortages and poor weather, according to the brand. Marriott began researching modular construction in 2014 by identifying companies that could potentially manufacture hotel spaces. After a selection process, Marriott then launched its pilot modular initiative at its 2015 Connect conference. Since then, the company has spent time working with select owners who were early adopters of modular construction for their projects, as well as educating lenders about financing such projects.